When the Harvey nominations were announced last week, many people noted that there was an unusually heavy emphasis on books published by Valiant. I don't know of anyone who's seriously questioned the integrity of those running the Harveys, but more than a few people quickly jumped to the (probably correct) assumption that Valiant made a big push to get all their books in the running. After all, Harvey nominations come from comic book professionals themselves. At some level, it's kind of surprising we haven't seen (to my knowledge) the Harveys skewed this way from another company in the past. But I haven't seen anyone in an official capacity admit there was an active campaign to get Valiant books a lot of nominations -- their website does note the high number of nominations they received, but only in a self-congratulatory way. What's interesting, and what I haven't seen mentioned by anyone else, is that Comic Bento boxes arrived for subscribers last week containing only Valiant titles, as you can see from the photo. Comic Bento, if you're unaware, is a subscription service where customers receive four relatively recent (past 5 years or so) trade paperbacks every month, selected by Comic Bento. In the few months I've been testing, I've gotten a variety of books that I would not have purchased on my own at full price, but at the discount Comic Bento provides, they generally haven't been too bad. I'd noticed in a previous shipment that one of the books seemed to have been produced specifically for the subscription. As far as I could tell, the pamphlet comic series it reprinted had never been collected before, and there was a note in the indicia about the book being a Comic Bento edition. So clearly, publishers are working with the Comic Bento team at some level in putting together these subscriptions. And that's fine. But when a "publisher spotlight" box shows up a few days after that same publisher is shown to be sweeping the Harveys, I'm thinking it wasn't the Comic Bento team driving the bus this month. 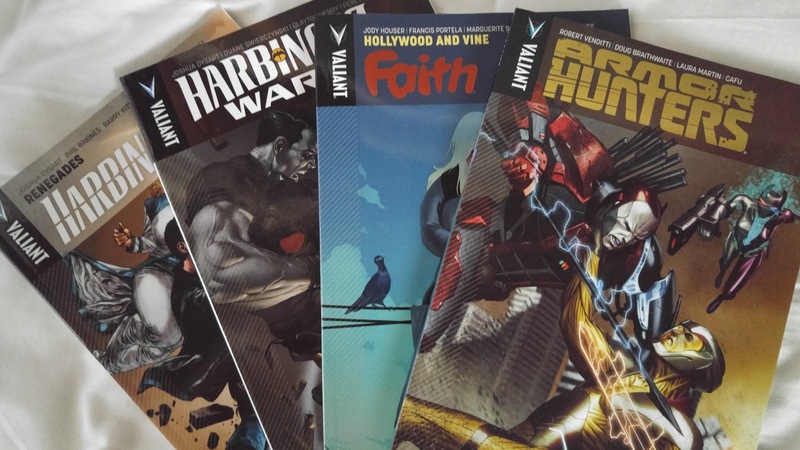 There's nothing wrong with that per se, but it does make me even more skeptical of Valiant. Honestly, I had heard a lot of chatter about them previously, and a few months back, I opted to grab a few of their books to see what was what. What I read was generally okay, but nothing that really struck me as particularly catching. Good art, but not nothing earth-shattering. Good stories, but nothing that grabbed me. I gave them some small props for having Faith as an overweight hero, but that was about all that stood out as appreciably noteworthy. Other than Rai (which I quite disliked) there was nothing really bad about any of the books, but I would have been fine never reading another one from them again. "Unremarkable" would be the word I'd use. So it seems that these Harvvey nominations are more the result of an aggressive marketing strategy than anything else. Which seems a little curious. I mean, awards are great and all, but why spend so much time and effort trying to ensure you'll get one? Seems like any additional sales you might get out of the attention would just be sucked up by the money you spent in marketing. Someone on Twitter (and I apologize for not remembering who) clued me in to a possible motive, though. They noted that Valiant reminded them a lot of Platinum Studios which, you may recall, put a lot of time and effort into making okay comics for the express purpose of turning those ideas into movies. It was designed and built as an IP farm. (Arguably, Marvel and DC are just idea farms for movies and TV these days, too, but they weren't designed as that originally.) I have to wonder if Valiant isn't trying much the same thing, albeit with slightly more interesting IPs. That's the only thing that's made sense to me so far, because seriously, that is WAY too much time and money spent on upselling your product for an award that will not come close to boosting sales numbers.